^ "Ambient Pop". AllMusic. Retrieved 10 July 2017. ^ "Post-Rock". AllMusic. Retrieved 31 January 2017. ^ a b "Neu! - Neu! | Songs, Reviews, Credits | AllMusic". AllMusic. Retrieved 19 January 2017. ^ "The Quietus | Opinion | The Quietus Essay | How Motorik Infected The Mainstream, By Future Days Author David Stubbs". The Quietus. Retrieved 19 January 2017. ^ a b c d e f g h i j k l m n o p q r s "Rolling Stone (GER) about Krautrock Artists". Rolling Stone. Retrieved 14 December 2017. ^ "Annexus Quam". AllMusic. Retrieved 23 March 2018. ^ "Bröselmaschine". AllMusic. Retrieved 10 December 2017. ^ "The Cosmic Jokers". AllMusic. Retrieved 10 December 2017. ^ "Deuter". AllMusic. Retrieved 10 December 2017. ^ "Gila". AllMusic. Retrieved 10 December 2017. ^ "Harald Grosskopf". AllMusic. Retrieved 10 December 2017. ^ "KPM-WDR (german)". AllMusic. Retrieved 23 March 2018. ^ "Mythos". AllMusic. Retrieved 10 December 2017. 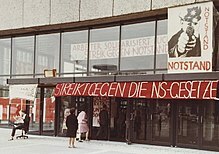 ^ "Nektar (german)". Retrieved 23 March 2018. ^ "Thirsty Moon". AllMusic. Retrieved 10 December 2017. ^ "Wallenstein (german)". Retrieved 23 March 2018. ^ "Xhol Caravan". AllMusic. Retrieved 23 March 2018.